volunteerFAU | Here to connect students to the community! Here to connect students to the community! Students Advocating Volunteer Involvement (SAVI) and The Weppner Center for Civic Engagement and Service hosted a Habitat for Humanity service project on Saturday, June 22 from 12:00-5:00 p.m. Our build site was a one-story house in the Boca Raton area. We were able to see and hear the home-owner speak before we began the service about how thankful she was that we are helping build her a home. The students were excited to volunteer and dived right into work as we broke out into small groups around the house. We placed wood in the ceiling inside the house, secured the windows, and worked on the roof work. Everyone helped out and when they were done with their own work, the students would look for something else to do in order to help. Overall, we were able to accomplish what the Habitat crew needed and the FAU students were very happy with the service. On the evening of April 4, 40 students gathered in the Burrow (Jupiter’s Student Union) to partake in the First Annual Dance Marathon event on the MacArthur Campus of Florida Atlantic University. Many were already sporting their ‘Can’t Stop, Won’t Stop’ tank tops, ready to dance the night away in honor of the patients at Shands Hospital in Gainesville, FL. The event began with Mrs. Elizabeth Rhodes, an ambassador for Children’s Miracle Network (CMN), telling the story of her daughter’s battle with brain cancer, and how CMN helped her daughter, and their family, adjust to living in a new place and face such a diagnosis. CMN, as she said, improved their quality of life. At 6:00 pm, the dancing began. Owsley made an appearance, motivating the participants to ‘dance their hoot out,’ and added to the overall fun nature of the event. During each hour, the musical genre changed, and included genres like Top 40 hits, Latin and Swing, and even Classic Hits from the 70s and 80s. This kept the crowd excited, and ready to dance for 6 hours. By the end of the evening, more than 50 people passed through the doors. We earned $125 that night alone, for a total of $450 that went directly to Shands Hospital. I am incredibly proud of the students that attended this event, and putting the needs of others before themselves. Moreover, I am pleased to announce that this program will continue to be held on the MacArthur Campus for years to come, and will become a traditional program for Students Advocating Volunteer Involvement. Kindness Week featured a different event each day to promote peace and giving on the MacArthur Campus. The events included a peanut butter & jelly relay race, paper crane making, graffiti art, random acts of kindness tree, and our annual human peace sign picture. The peanut butter & jelly relay race was a timed competition between two teams to see to make 40 sandwiches;, these sandwiches were donated to Quantum House of Palm Beach County Paper cranes, within the Japanese culture, are thought to bring good luck, so students were encouraged to made multi-colored paper cranes, which will be displayed in the student resources building as a reminder. This year’s graffiti art was centered on the social justice issue of diversity; students designed and painted canvases depicting their thoughts about diversity. The random acts of kindness tree was placed in the Burrow Student Union. Students selected a lollipop and an act of kindness with the promise of ‘paying it forward’ that day. 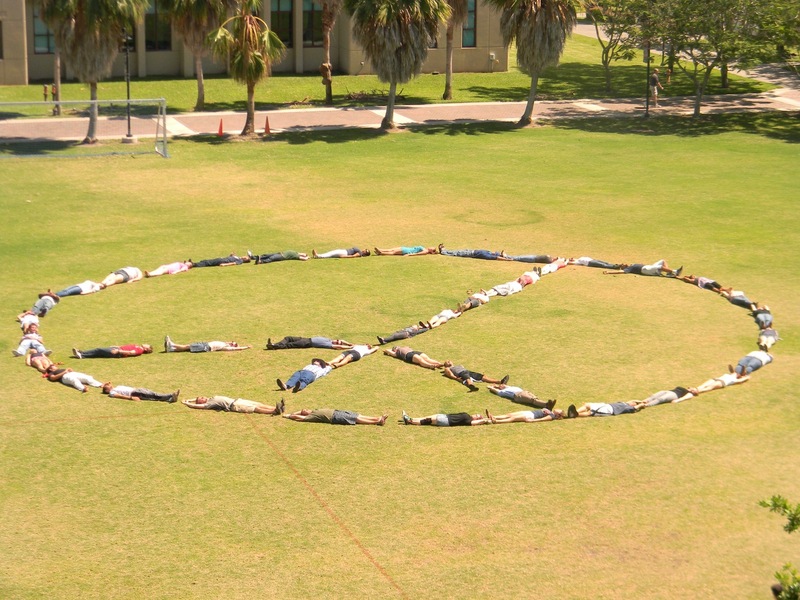 Finally, on Friday, a group of students came together to form a peace sign on the recreation fields for this traditional, well-loved event.. Kindness Week on the MacArthur campus was full of fun activities, promoting a wonderful sense of caring and giving amongst all of the faculty and students. On March 22, 2013, a group of 21 FAU students volunteered at the east location of Florence Fuller Child Development Center in Boca Raton – center dedicated to making a positive impact on young children from economically challenged families in the community. As soon as the group of FAU students stepped into the Center they entered a room full of smiles and laughter. The children at the Center couldn’t have been more excited to have guests. There were different stations of leisure activities such as Twister, arts and crafts, and karaoke set up throughout the room. The volunteers helped facilitate the activities while playing along with the children. They were able to brighten up the children’s day while lightening of the usual facilitators of the Center. Overall, it was a very productive and fun filled afternoon. Inspired by the motto ‘Take it Off For the Less Well Off!,’ FAU-Jupiter students gathered in the Housing Courtyard on a brisk January evening to compete in the 6th Annual Great Underwear Dash. Students met prior to the race to donate clothing items that would be given to charity. At the strike of eight o’clock, the 20 participants lined up, ready to dash, and with the blow of a whistle, threw off their final top or bottom and ran to the Pool House. This year, it was a true ‘underwear dash,’ and onlookers were amazed—and slightly puzzled—to see minimally clothed students running through the heart of the MacArthur Campus. All-in-all, SAVI received about 100 articles of clothing, which were provided to the Homeless Coalition of Palm Beach County. It was a great time, and this event will be held by SAVI-Jupiter for years to come! This service Saturday to the Palm Beach Zoo was a huge success for SAVI! The event was co-sponsored with Alpha Psi Lambda Co-Ed Latin Fraternity Inc. and had a full turn out of about 33 students who came out to work with the horticulture department at the zoo. Our task was to clean up an area filled with plants, dirt, and garbage in order for the zoo staff to start growing food for the animals. The aftermath of the clean-up was amazing! The entire area was cleared and ready for planting. Everyone worked together to help out and didn’t mind getting their hands dirty. After, we had lunch and got the chance to walk around the zoo to see the animals. The students loved it since they got to enjoy themselves after a lot of hard work. This is definitely something we will do again. Countdown to the ASBest week of service you'll ever be a part of!